I have had same problem with my diamond pass didn't stipulate Day ? Thats great Ray thanks for the advice. Never had a pass before, so just wanted to ask people in the know. 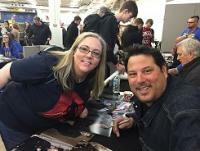 Last year i think meeting Greg Grunberg was great, such a lovely genuine bloke and had time for everyone and great in the photo shoot too which made my day. Jessica Henwick was lovely too very down to early and had time for everyone. I could name a few more but last year met lots so hard to choose from. More Guest Announcements Friday @ 7pm!